Designed for the most demanding IT applications, such as data centres, ISP and ASP and call centres, MODULYS System guarantees unparalleled continuity of service. Offering a large number of available slots, it can be easily upgraded in terms of power and back-up time, and provides the essential redundancy required by these strategic applications. MODULYS System is controlled by digital circuits. Their use allows for greater precision and ensures that the operating parameters of the whole system are stable over time. MODULYS adapts easily to changes and to the growth of your system. Power modules of 1.5, 3, 4.5 and 6 kVA, in tower, rack and system versions are easily combined to ensure the ideal configuration. MODULYS is a modular UPS. The number of Mod-Power and Mod-Battery units can easily be increased to provide redundant operation, from N + 1 to N + X. In this way, total availability of the system is achieved, even if one or more modules are inoperative. MODULYS has “hot swap” power and back-up modules which can be replaced or inserted while the system is in operation. In this way, true continuity of power supplied to the load is achieved, without any interruption of service. MODULYS modular design allows the number of modules to be increased and therefore, the power and back-up time of your UPS to grow. In this way you can easily cope with future situations which you are not able to predict today. MODULYS is the most compact UPS in its category. Whether in stand- alone version or one of the many system configurations, the installation takes up very little of your working area. Each power module has its own integrated controller and an automatic bypass. 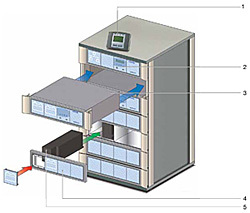 In the system version, this design provides an additional guarantee since the load will be powered even if one of the modules is not working. MODULYS System is the most flexible and modular system in the entire range.